Well, since I haven't worked with this scale in quite a while, and my aging eyes not being what they used to be, I decided to start with the vehicles and stick to prep work on the boat. I ordered an extra set of photo-etch so I can really make this kit pop. 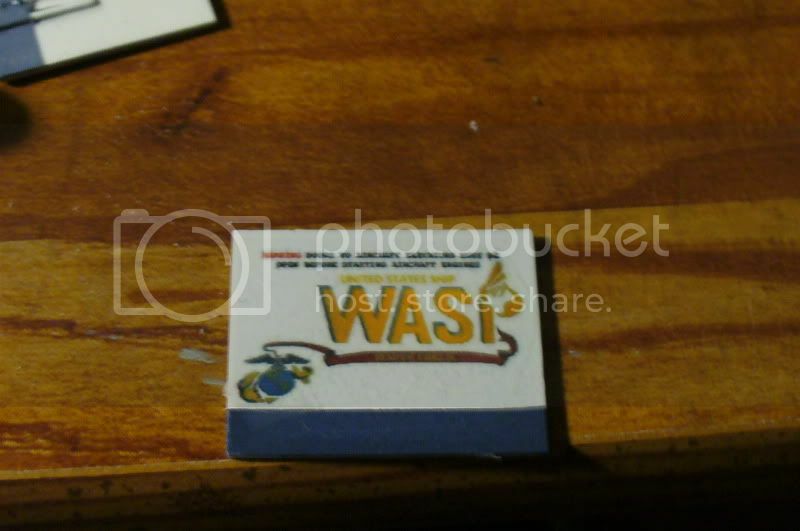 That's a total of 6+ sheets of photo etch I'll be putting on this kit. Wow! 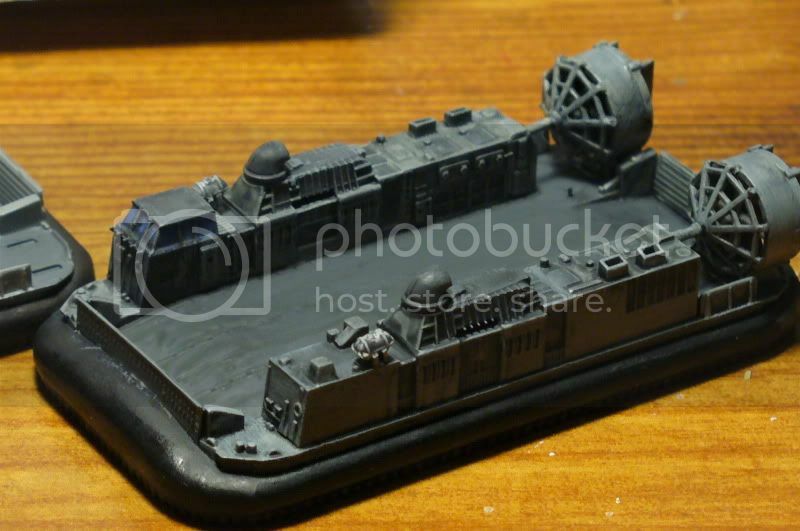 These vehicles are small, and the LCAC is a model kit all it's own. I'm amazed at the amount of detail. Here's some pics. Prepping everything for painting. All of the vehicles had some sort of assembly And you can just make out Victory in the back. My wife is getting ready to paint the craft room so I haven't found a place to keep Victory safe, so she stays on the workbench for the moment. 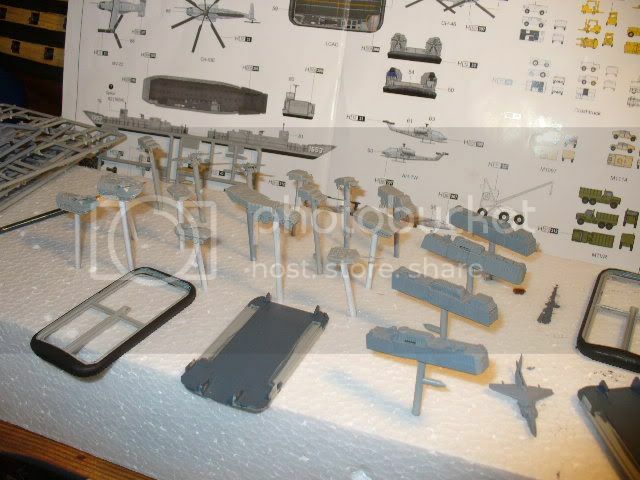 Lots of pieces for the LCAC. And it's only 3" long! 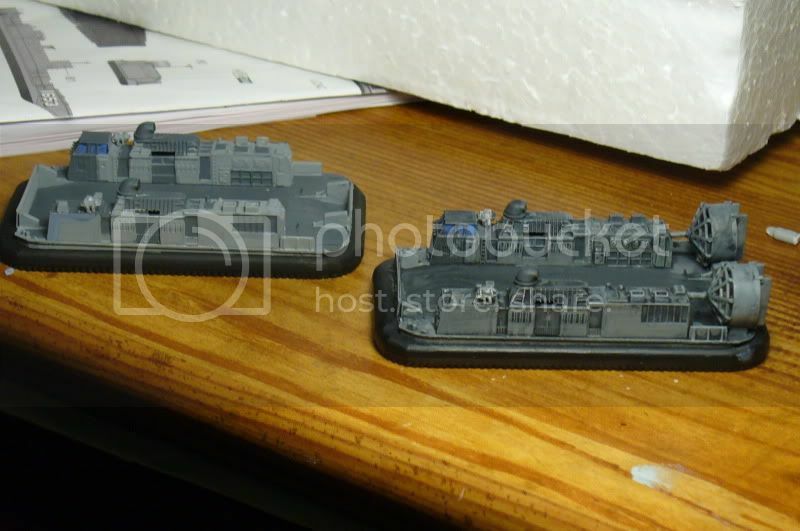 Here's the APC, Bradley, and M1's in progress. I went with forest camo on the APC and Bradley in order to keep the overall picture from being "boring". 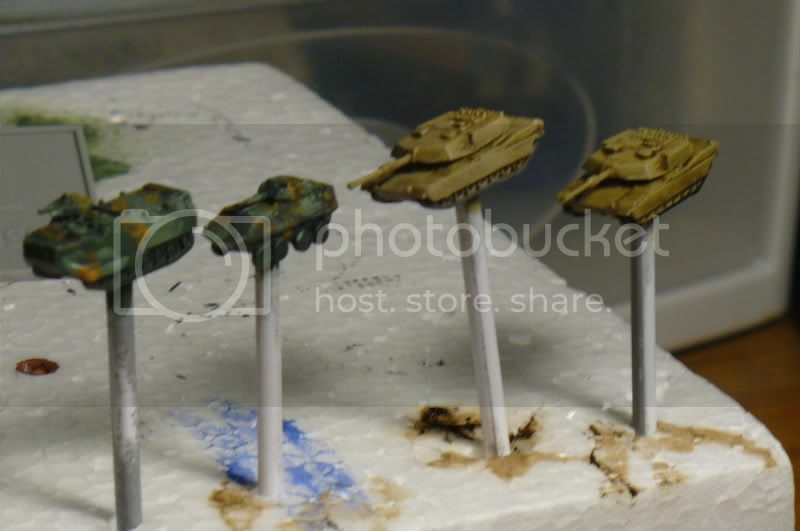 The M1's are my first real adventure with future as a sealer and oils for washes. On the left is a wash using linseed oil as thinner. After talking with Rob (thanks again Rob), I changed over to an odorless turpentine for the M1 on the right. The wash really made things pop. I still have some detailing to do on all the vehicles. LCACs in progress. Unwashed on left, Washed and drybrushed on right. I really like these little guys. There is a lot going on on them. I still have quite a bit of detailing to do on both. Still a lot of detailing to do, but I'm not unsatisfied. The wife has since torn the craft room apart (she has a scrapbooking table and equipment in the room with me) as she gets removes switch/outlet covers, sands the walls (yes, I said sands the walls) and masks off all the moulding for painting and my workbench is now in the center of the room, so any work on the kit this weekend will be out of the question. I may get a few things done tomorrow. I'm busy doing simple base-color work on the well deck. 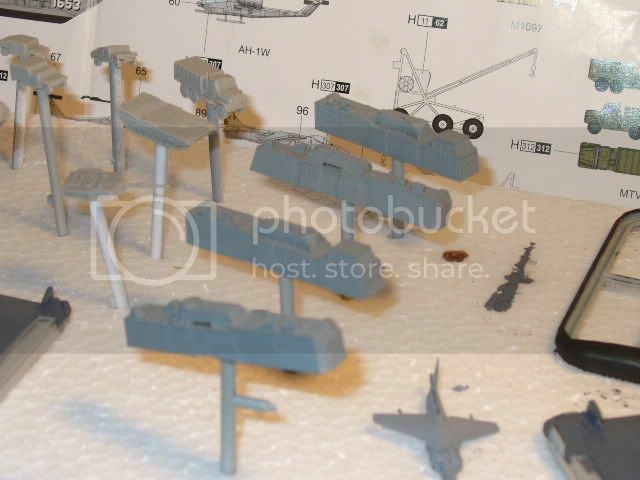 The extra photoetch should be here early next week so I'll be able to get busy on the various helicopters in the kit. 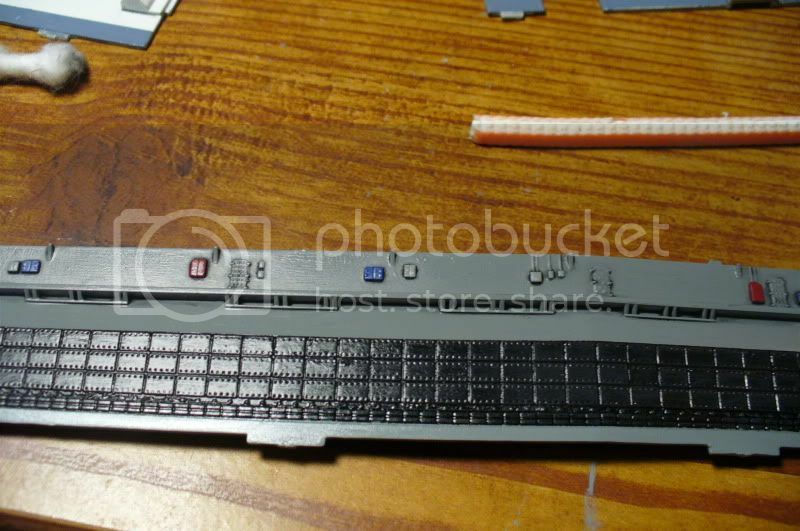 The photoetch rotors will allow me to get very realistic blade sag, and I can't wait for the extra railings, which are a must for the well deck. Well Phil there is no need to ask what you have been doing the past couple of weeks! Great progress and keep those pictures coming. Whoa, easy tiger, don't them people ever clean their machines? Looking forward to your "future" updates. I have always been a fan of a "dirtier" look. The LCAC is in no way finished so it will look a little "cleaner" once I'm done. Found this thread over on MWS http://www.shipmodels.info/mws_forum/vi ... =2&t=65149, which discusses lighting the interior of the Wasp. 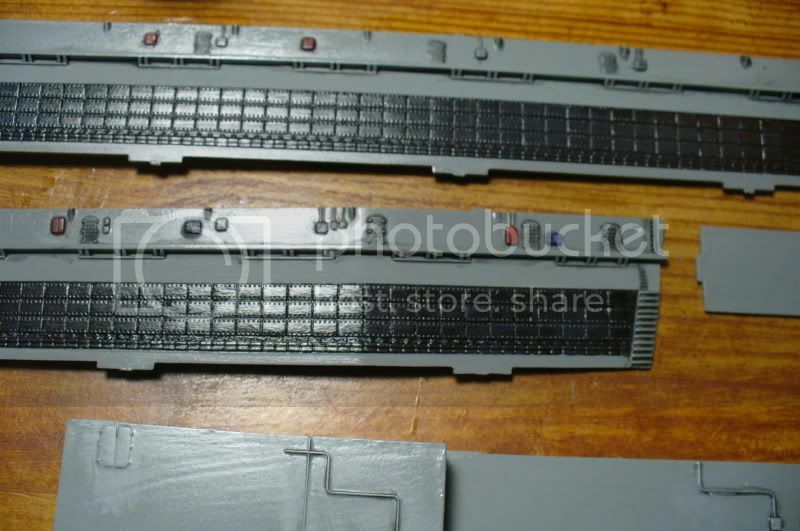 The modeller in question has used EL (electroluminescence) products to light the hanger deck. EL provides a more even spread of light rather than the point type associated with LEDs. You can get filters to adjust the colour, which would allow the green NVG lighting in the well deck to be replicated. Wow. I had heard about this type of lighting and I must admit, it's very cool. I'm also impressed by the build you directed me to. I've been going over everything I want to do and I humbly admit it may be a bit much given the timeframe I have for the build. I'll have to see what I'm actually going to be able to accomplish with available funds (translation- what the wife will allow me to buy). 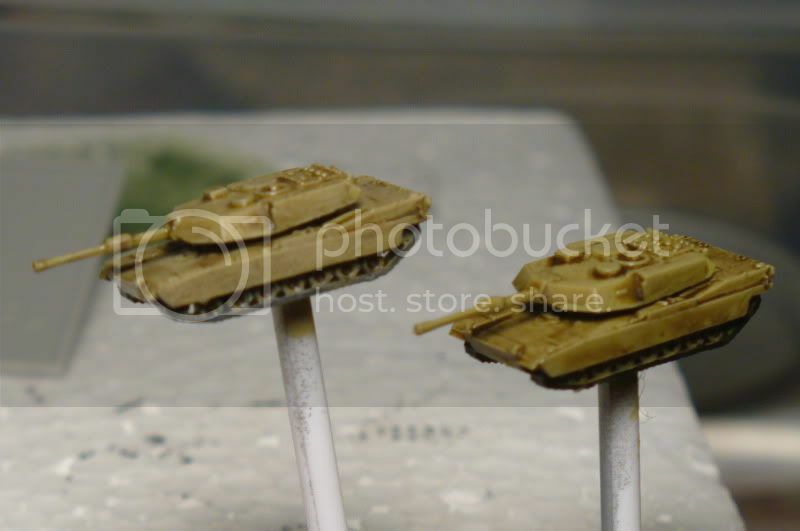 Oh, does anyone know of anyone making 1/350 MRAP vehicles? 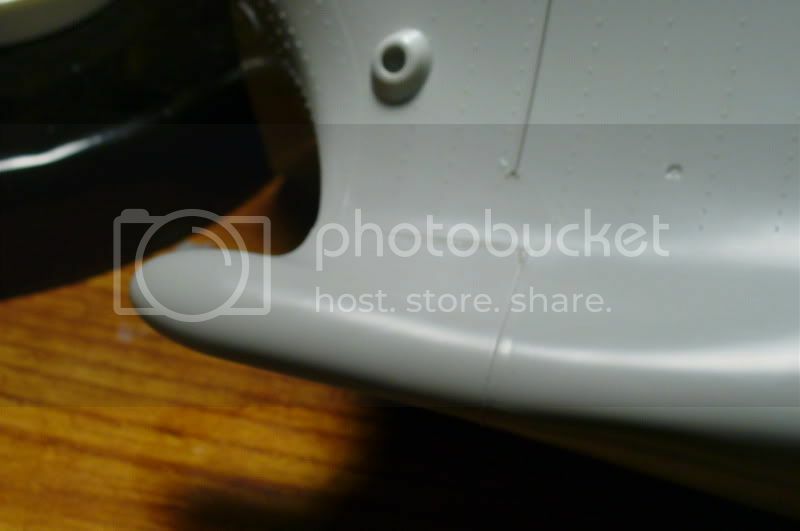 Stumbled over another WASP build on MWS (http://www.shipmodels.info/mws_forum/vi ... 59&t=61207). 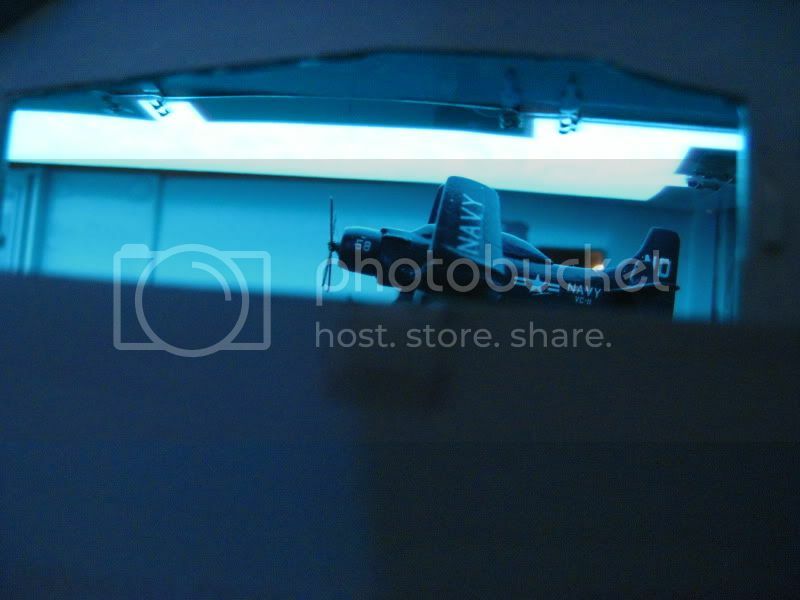 This one has some nice work on the hanger as well, including decals, which make a world of difference to the internals. He's really going to town with that build. Well, off to work if the weather will allow. Fresh snow covered the roads a couple of days ago and we're expecting another round by Monday, which will make driving treacherous once again. 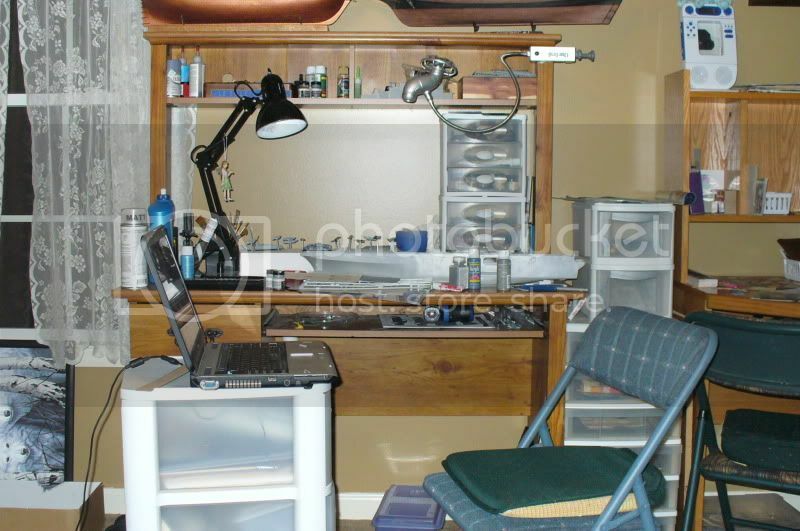 The wife paints the craftroom today so I should be back at my bench tomorrow afternoon. More vehicles to paint and then on to aircraft and the well deck....have a good day everyone. Oh, thanks again for all the support and links. They are very helpful. This is the wall of the well deck. It's painted, clear coated, and pin washed. Being new to the this technique you can see I am not as "pin" point as I'd like to be. It's still not perfect, but it is a lot better and I'm getting very confident with the technique. I'm still playing around with the wash mix. It's a learning thing. 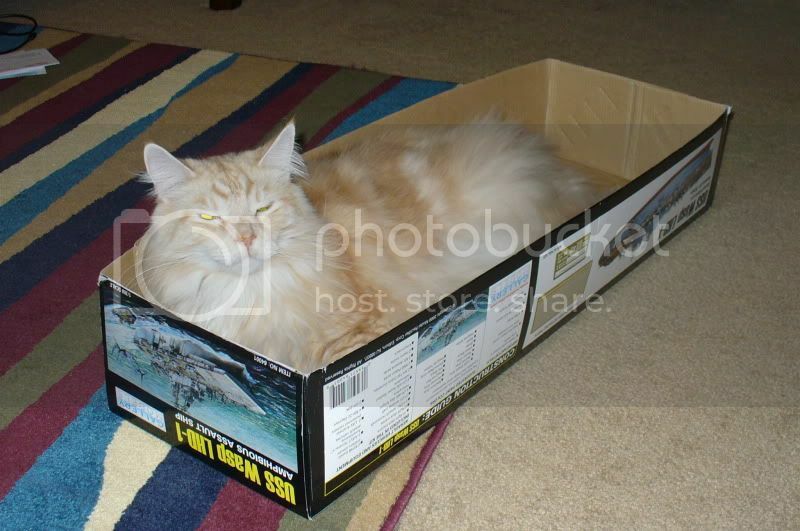 I'm sure I'll get the hang of it before I tackle above deck. YEAH, THE PACKERS JUST SCORED!!! Sorry about that. This years Superbowl is awesome.. Anyway, I decided to go ahead with some assembly on the superstructure, which will be preshade and pinwash heaven. 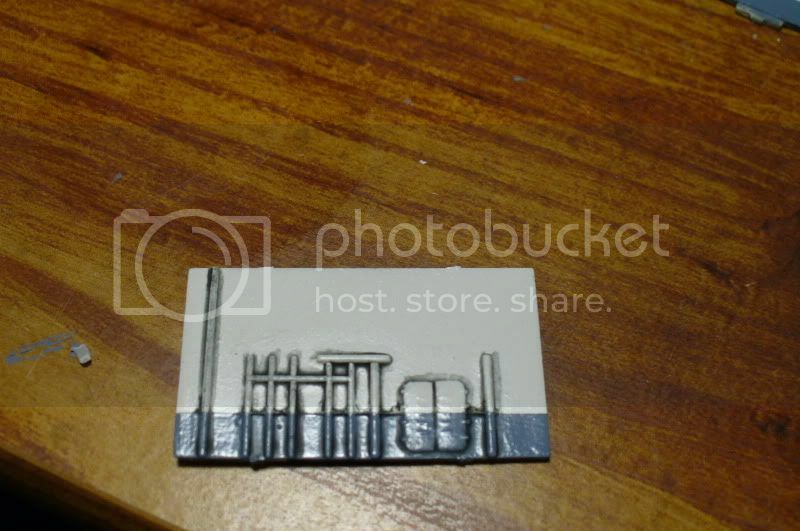 I'm also expecting my photoetch upgrades to arrive this week, so you'll get to see a newcomer to the metal struggle with yet another new technique as I try to raise my level of modelling skill. Well, the extra photoetch finally arrived from South Korea. And to say there is a few pieces of etch would be an understatement. 4 sprues of several hundred pieces. 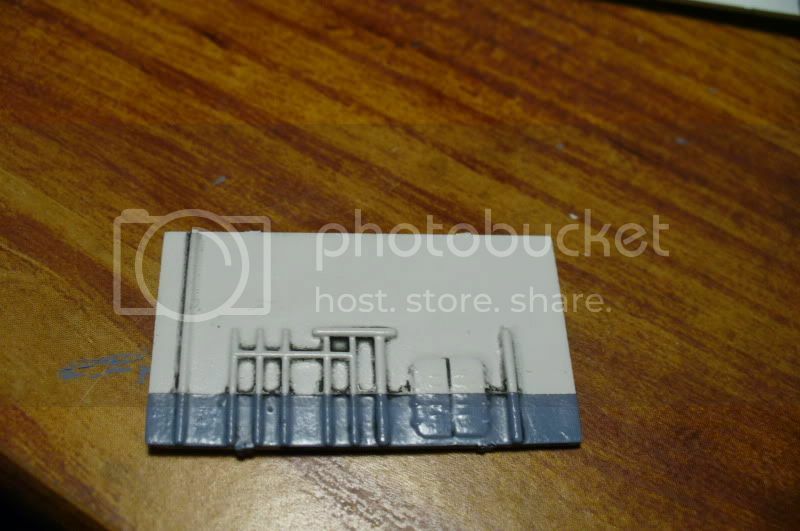 So I ask my fellow modellers who have had experience with etch to post their tips and tricks for using this wonderful material. I'm most curious at the different ways to adhere the pieces to the model. I found a couple of good articles on the web but I like getting a lot of input. Thanks in advance for any help. 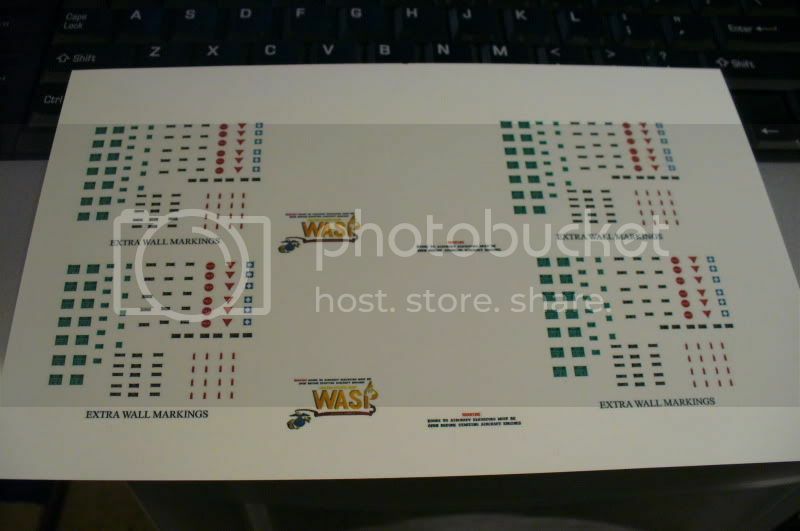 I do want to thank Bill for sending me the file with the hangar-deck decals. They have worked out very nice. And remember I told you I'm a rather "chaotic" modeller. The pic below pretty much says it all. I didn't get anything done today. I had a much better time with the Missus at dinner. I loved her smile when I gave her her Valentine's ring. I have another day off Wednesday and will be diving headlong into decals and etch....stay tuned. - Darling have you seen the cat? Your modelling area actually looks quite tidy and well organised to me! The only glue that I have ever used with any success for etch is medium visc' ACA, still a bugger at times though. Why is it that etch will stick to your fingers/tweezers but not to the model (especially when it's that tricky but vital part)?